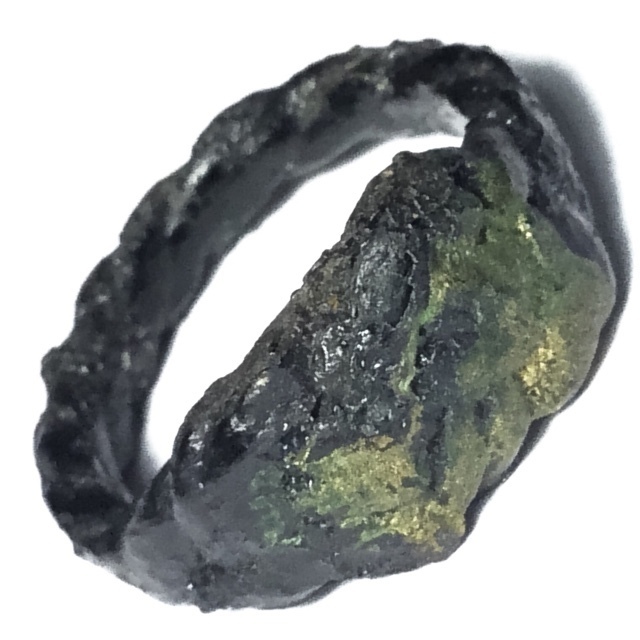 An extremely rare example of the Hwaen Pra Pirod ring of the great Petchburi Master Luang Por Hai, of Wat Bang Talu. Luang Por Hai was a Gaeji Ajarn Guru Master of the Paetchburi Province, whose Hwaen Pirod rings became extremely famous for their Klaew Klaad and Kong Grapan Chadtri power to protect. Paetchburi province was always known for its high number of bandits and highwaymen, and the Wicha Maha Ud, Klaew Klaad and Kong Grapan Chadtri were the most popular kind of Magic for both the citizens who sought protection against the bandits, and for the bandits themselves, to protect themselves against the bullets of the police. When we speak of the Petchburi Province Masters of Old, one will always hear of and think of the temples of Wat Tanode Luang (Luang Por Tong Sukh and Luang Por Phaew), at Grajiw, and of course Wat Khao Bandai It (Luang Por Daeng). One must also think of the temple of Wat Khao Song (Luang Por Lae). But when it comes to the Wicha Hwaen Pirod fireproof ring of Protection, as fare as Paetchburi Province is concenred, one has to raise the names of Luang Por Plern (Wat Nong Mai Hlueang), and Luang Por Hai, as the Masters of the Wicha of that Era of Paetchburi Masters. The Wicha Hwaen Pirod, is an extremely ancient form of Sorcery, which was used by Ancient Folk, and was still very much in use up to about the Second World War Era, after which Modern Era saw this Wicha begin to become a much less commonly seen amulet, as times of peace brought people to seek more Metta Maha Niyom and Maha Sanaeh, Maha Lap type Wicha, for wealth, love and happiness, instead of protection from weaponry. The Hwaen Pra Pirod remained an essential talisman for gunmen, military and police, as well as bodyguards and secret service agents, and of course bandits. But the common folk needed this kind of amulet less, and so the Hwaen Pra Pirod became the rare Wicha it has become today. The Hwaen Pra Pirod of Luang Por Hai, is considered equivalent in its power, rarity and level of desirability with collectors, to the famous Takrut Pork Krang Renous Paste coated Takrut spell of Luang Por Tong Sukh (Wat Tanode Luang), making this a highly desirable amulet for those seeking Maha Ud, Klaew Klaad and Kong Grapan Chadtri. The wearer should not 'Dtaay Hoeng', meaning, will not die in disastrous circumstances. The Hwaen Pirod ring, was an essential part of the occult and ceremonial armory and regalia of the ancient Warrior of Siam. The Warriors of Olden Days used both scientific weaponry such as swords, knives, maces, lances, clubs and other weaponry and armour, but also armed themselves with a highly practiced and memorised repertoire of Magical Spells and Sorcery, to protect and aid in winning the battle. The Wicha Kong Grapan and Klaew Klaad are both directly derived from the Warrior Clans, who recieved these Wicha from their Lersi Kroo Ba Ajarn, for their own protection. The ring is made from Sacred Yantra Cloth, Sinjana Corpse Cords and coated with laquer. The Pra Pirod Ring Amulet is a Wicha of Kong Grapan Chadtri and Klaew Klaad Evasive Protection is effective as a protective spell against all forms of black magic, sorcery, evil eye, demons and physical dangers, which derive from weapons of war, sharp and blunt instruments. Klaew Klaad Evasive Magic is also inflected to prevent any deadly accidents or disasters from befalling the wearer. The Wicha Tam Hwaen Pra Pirod, is a very ancient form of Magical Sorcery, from very long before the Siamese Kingdom existed. It was used by Warriors in ancient times throughout the Southeast Asian continent, and particularly later, during the times of war between the Kingdoms of the Khmer and Siam. This magic spell is also made as an arm-band, called a ‘Prajiad’, which was, and is indeed still in ceremonial form, worn by Muay Thai boxers, and was worn into battle by warriors of olden days. Both the Prajiad, and the Hwaen Pra Pirod, use the same form of magic spell which consists of entwinement and binding spells, with Maha Ud, Kong Grapan Chadtri and Klaew Klaad Powers. The material used for the making of these magical rings of protection is Sinjana Cords and Yantra Cloth. Very few Guru Masters who still possess this particular magic spell in these days, and knows its methods of making. It can almost be said to have nearly died out in its entirety, as a form of magic spell. This Wicha as old as that all of Sak Yant sacred geometry tattoos, which also dates centuries back into the far-flung history of South East Asian occultism. To see this kind of amulet, is these days in any case extremely rare. For this reason, as well as for it’s immense ancient sacred powers the Amulets, is also highly collectible and then extremely interesting item to possess as an exhibit, in one’s personal showcase. Kata Pra Pirod - Incantations for putting on, and removal of the Magic Warrior Ring of Protection and Power 'Hwaen Pra Pirod' often also commonly known as 'Hwaen Dtakror'. This Incantation is also used for invoking and putting to sleep of the spell within the Sak Yant Tattoo 'Yant Pirod', and 'Yant Look Dtakror'. The ring, if too small or large to fit on the finger, should be worn around the neck on the pendant chain, or can be carried in the pocket, for concealement. Being generally small in size, they can be encased in waterproof casing, or, be just placed inside the pocket. Wearing the amulet concealed inside one’s pocket, is very popular with many members of the military, due to the fact, that these days, one is not allowed to wear a ring whilst in service, or in battle.